In this book, ‘Designing culture: the technological imagination at work’, Anne Balsamo, Professor of interactive media at the University of Southern California, calls for a new approach to technological innovation arguing that culture must be taken into account when it comes to participating in any form of technological development and innovation. The ‘technological imagination’ Balsamo expresses, lies at the root of such technological innovation, which takes place across diverse disciplines and within numerous levels of society. What lies at the basis of her arguments is the lack of culture being integrated into notions of technological design and innovation whilst the aspect of culture is in fact deeply intertwined with such practices. Departing from this, her book may be viewed as a component of a much bigger transmedia project in which she incorporates various media forms all of which bear relevance to and demonstrate the arguments she makes. Her efforts have come together to create an interesting interactive project, which calls for a deeper understanding of the role of cultural discourses with respect to the creation of ‘technocultures’ and technological design on a greater scale. Therefore, the interactive component of this project, www.designingculture.net, must also be included in any discussion of her book. What is central to her work is her plea for collaboration between people within many different disciplines in service of cultural reproduction within the technological era, and the necessity of such collaborations in light of future technological innovations. The notion of ‘the future’, is therefore also of great importance with regard to her work and specifically the discourse she presents in both the book and the accompanying interactive website. In addition to these resources there is also an accompanying DVD that comes with her book entitled, ‘Women of the world talk back: gendering the technological imagination’. This interactive DVD is a documentary that concerns the NGO forum which took place at the 4th United Nations World Conference on women and discusses the role of women within technology related fields of work such as science, engineering and mathematics. Returning to the notion of ‘the future’, Balsamo specifically stresses how contemporary technological innovation essentially designs ‘future cultures’. Departing from this assertion, Balsamo puts forth that cultural theory must be incorporated into such processes of technological design and innovation in order to effectively shape future technologies in service of cultural (re)production. This approach, Balsamo puts forth, has been surprisingly unaddressed and must be researched to a much greater extent to allow for a better understanding of how such cultural dimensions of technologies may help to better understand emerging ‘technocultures’. Approaching technology from this angle, Balsamo presents ten lessons on how future technological applications may have greater consideration for cultural innovation and how incorporating such tactics may positively impact educational practices to pay better attention to such ‘technological imaginations’. “The wellspring of technological innovation is the exercise of the technological imagination. This is a mindset that enables people to think with technology, to transform what is known into what is possible. This imagination is performative: it improvises within constraints to create something new. It is through the exercise of their technological imaginations that people engage the materiality of the world, creating the conditions for future world-making” (Balsamo: 2011). In asserting this, Balsamo goes about her research from the perspective of a ‘technological imagination’. What is important is that such ‘imaginations’ take shape or form in collaborative assemblages which essentially make up such technologies. An application is not merely a technological object or artifact but instead an intricate mechanism within which many different elements play a role. Social structures and policies come together with technical elements to create such applications, and it is this underlying basis that lends itself to the (re)production of culture. What comes forth from this is that technological design and innovation often times depart from a vantage point of technical elements disregarding the various ways in which these constructions may be shaped in such a way as to actively exercise control over the production of such ‘future cultures’. If cultural theory is then incorporated more intensively and at earlier stages of such technological design and innovation, it may be possible to produce better technologies which actually take into account the various dimensions of such cultural reproduction. Such applications and technological objects then allow for diverse interpretations which stem from people’s individual backgrounds and cultural heritages. So in order to better design such future technologies to encompass and allow for such cultural contexts, the ‘technological imagination’ reveals itself as a very multidisciplinary construct. The (re)production of culture takes place on extremely diverse levels so in order to design applications better suited to accompany such cultural diversity it is apparent that such design processes must be highly collaborative and interdisciplinary in nature. In discussing this, the field of hermeneutics comes forth as an important and useful tool with regard to interpreting the underlying workings of such technological processes. The interpretations of users embody an essential aspect of the underlying cultural dimensions that technologies exhibit. So in researching the ways in which ‘future cultures’ take shape through technological innovation, Balsamo stresses the importance of meaning creation in relation to such applications, and how these in turn have effect on the products of such innovation. Throughout the book a strong theme is the democratization of technologies to better suit social needs and structures. Balsamo approaches this through discussing various initiatives and instances through which she is able to demonstrate the influence and capabilities presented by technological innovation. In discussing these instances she contextualizes the central themes of the book and offers insight into their meaning whilst simultaneously putting forth the various ways in which these concepts are embodied and set in motion. She does this by discussing the various themes in relation to several projects she took part in, which further demonstrate her premiss. 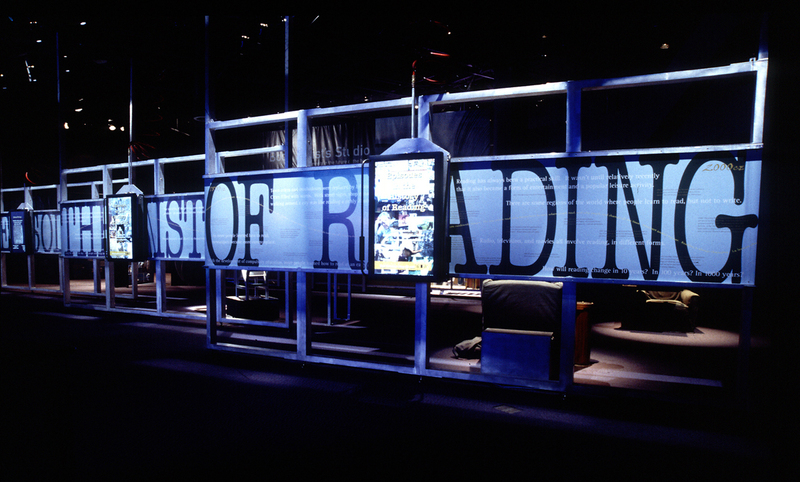 Amongst the various experiments she discusses is the, ‘XFR: Experiments in the Future of Reading‘, an interactive museum exhibit that (amongst other experiments) presents visitors with a history of reading through large physical walls on which digital screens display a myriad of media forms all pertaining to the history of reading and writing (picture below; click to enlarge). It is through such projects that Balsamo both presents and researches many of her findings and concepts and it is also these highly interactive projects both physical and digital (on the website) that make this book a component of a much larger initiative. The interactive website is therefore a crucial supplement to the book which allows the reader to better understand the bigger picture portrayed by Balsamo. Returning to Balsamo’s key concepts, she emphasizes the role of technological design and innovation in relation to learning environments and how such innovation holds the potential to transform learning processes. Active research into technological design and the underlying constructs that lead to ‘future cultures’ may be harnessed so as to further integrate digital media with culture, revealing workings of such technologies which have been sparsely researched. Balsamo puts forth several compelling concepts of how knowledge and culture are dealt with within the digital age and how technological innovation exerts influence on how ‘technoculture’ is (re)produced in this day and age. She also points out how research into ‘technocultures’ and the innovation of technology is predominantly concerned with economic aspects whereas there is very little research into the cultural side of this topic. It becomes apparent that this approach to researching such technological innovation is long overdue and lends to a new way of looking at such innovation. I personally believe that Balsamo has put forth a very interesting premiss that not only comprises of her book but extends into the interactive projects and artifacts both physical and digital that may be found in exhibits and on the website. It only seems logical that Balsamo is active within such research initiatives and experiments and this book delivers key insights as to the meanings and purposes of those projects and vice versa. Balsamo, A., Designing Culture: the technological imagination at work. Duke University Press, Durham & London, 2011.